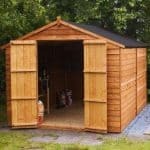 This shed has been built with versatility and value in mind. It boasts the very popular 8’x6’ size, offering plenty of space to store whatever you need to. However, whilst it is advertised as multi-purpose, you will need to spend a little money upgrading the floor if you plan on using it for anything other than lightweight storage. The pent roof increases assembly options and allows you to install the building anywhere that has various height restrictions. So for example, it could be built next to another building with an overhanging roof. Or you can assemble it underneath low hanging tree branches. This is the leading benefit of pent style sheds and they also offer great weather resistance. Shiplap tongue and groove cladding is used for the walls which is a lot sturdier and weather resistant than overlap. A fixed styrene glazed window is added to the front of the shed offering a lot more light into the building than a side fixed window. Styrene is also 100% shatterproof which makes this a brilliant choice for those with children or pets. 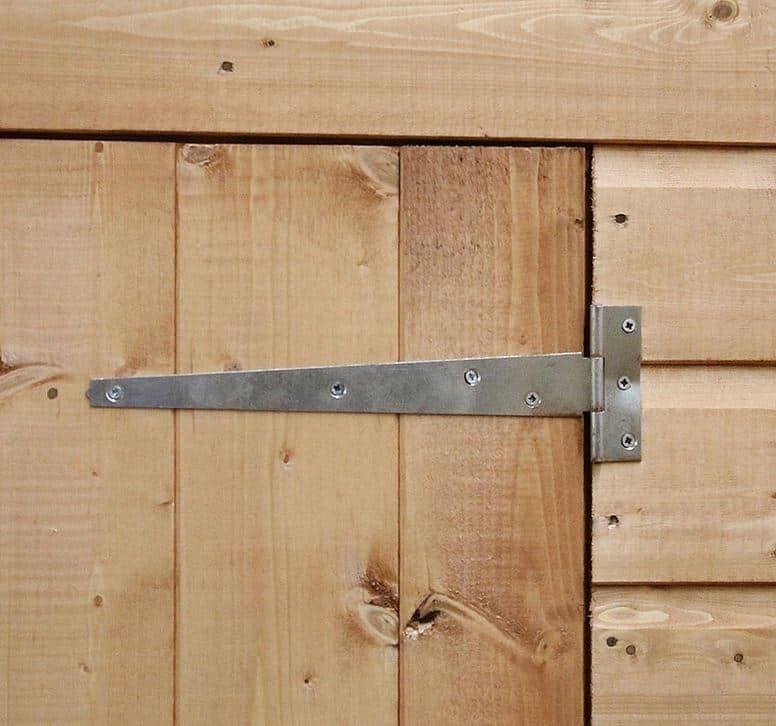 Whilst the window cannot be placed on the side of the shed, it can be switched with the door. So you do have slight control over the look of the building. Though advertised as a multi-purpose shed, the floor isn’t very rigid. This means it does have a flimsy feel and will likely struggle to withstand the weight of heavier items. Various measures can be taken to increase the floor’s strength however. This 8’x6’ building has been described as a multi-purpose shed. It claims to offer versatility as well as value and comes with a heavy duty exterior. As it is a pent style shed, it doesn’t offer as much height as an apex building. 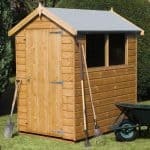 However, compared to many other pent sheds it offers a generously tall shed that is comfortable to manoeuvre around in. The door has larger than average measurements; both in height and in width. So compared to other models out there, this one does provide a more spacious design. Solid sheet makes up the roof and floor, which whilst isn’t uncommon, it is surprising given the purpose of the shed. The manufacturer’s claim it can be used for many different things, yet the weight of the floor restricts what you can store and what you can use the building for. For example, if you’re looking for a building you can work inside, you will likely need heavy machinery and furniture. This is more than likely going to damage the floor unless you strengthen it in some way. The pent roof is a benefit as it ensures you don’t have to worry about installing the building in height restricted parts of the garden. With its gentle sloping design, rainwater simply rolls right off the shed and doesn’t have the opportunity to soak through. The cladding is one part of the shed that we can’t fault. 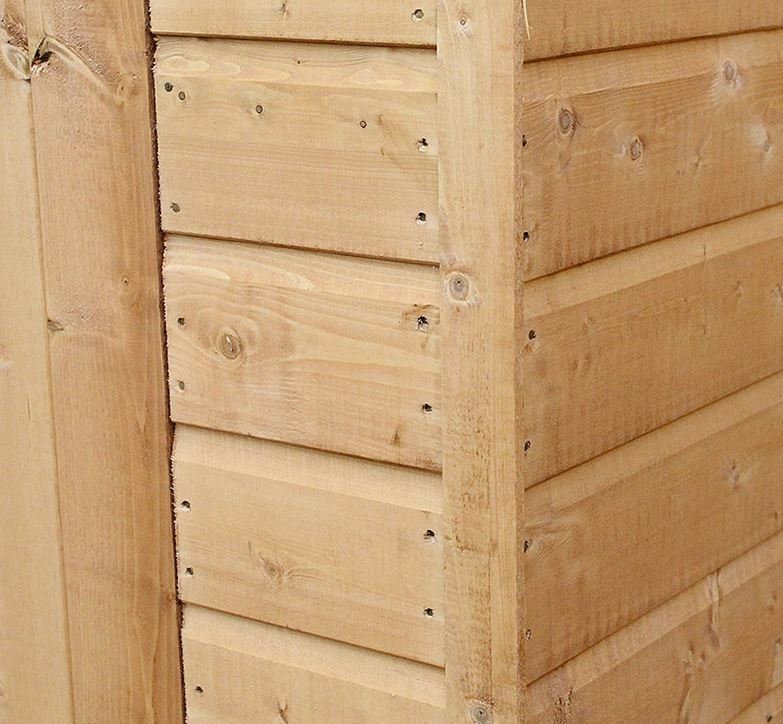 Built with high quality tongue and groove Shiplap, it benefits from a thick, weather resistant quality. There are a couple of things that give Shiplap tongue and groove its superior weather resistant design. Firstly you have the interlocking panels which make it difficult for rainwater to seep through and which also protects the interior from drafts. Then there’s the channels found between every panel. They drain the water directly down to the ground, offering the same type of waterproof design as the roof. 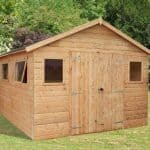 The use of a standard 28mm x 28mm frame is sufficient enough to give great support to the shed and ensures it remains stable in harsh weather. The timber is basecoat treated at the factory. 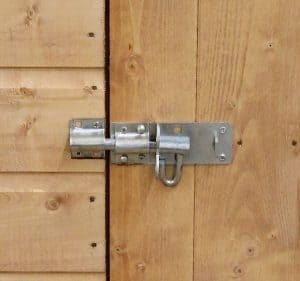 This means that whilst it is fully protected whilst being delivered, a high quality treatment will need to be added as soon as you have erected the shed. You will then need to continue with annual treatments if you want to benefit from the great 10 year anti rot guarantee supplied. The single door is placed slightly differently on this pent shed in the fact it is offset to the front side of the building. It also has a fairly thin design in comparison to some of its competitors. However, one thing it does have going for it is that it is braced. 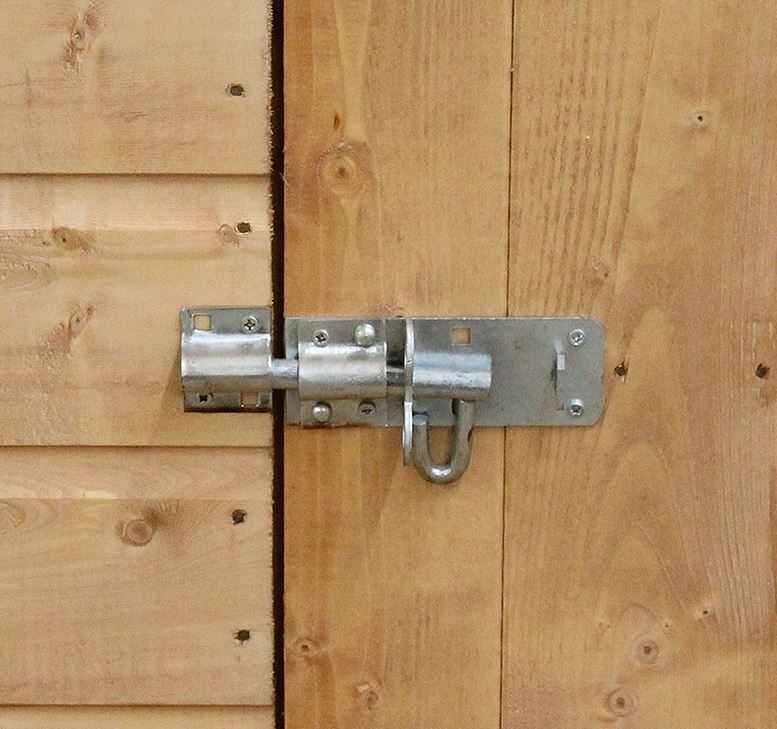 This reduces the likelihood of it sagging through heavy use and it is also secured shut with a pad bolt. The large styrene glazed window is also placed at the front and thanks to its solid, pretty big design, it manages to filter quite a lot of light into the shed. Styrene glazed, this window is also shatterproof so if it breaks there is less risk of injury compared to glass. Both privacy and security could be improved. In fact, your storage will only be secured from young children as although the door is fitted with a pad bolt, there is no padlock supplied. So this is definitely something that needs to be upgraded if you want to keep your tools and equipment safe. You do get more privacy from the front facing window than you would with a side facing one. 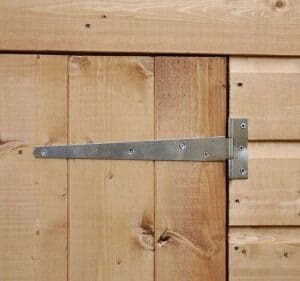 You can also add some form of covering such as a blind in order to keep your storage private when you’re not using the shed. You could feel a little overwhelmed by the choice of extras available with this building. However, not all of these extras can be considered ‘essential’. For example, the Assembly Assistance kit is a very good extra with a lot of useful tools included. However, if you’re used to doing DIY around the home, it is highly likely that you already have most of the tools contained within the kit. So this would largely benefit those who currently have no tools available. It comes with a 16 inch saw, hammer, safety goggles, safety knife, brushes and spirit level. There are other tools in there too, but those are the main ones worth mentioning. The base installation kit is potentially the least useful extra offered. Now in order to ensure a shed is completely stable, it needs to be built on an even and very solid base. 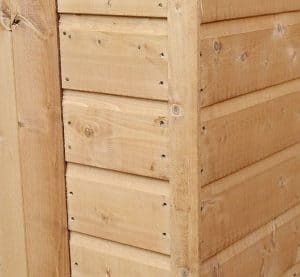 Not everyone has a concrete base to work with so a wooden base, such as the one offered by the Shed Store as an extra, can be extremely useful. These wooden bases do need to be assembled too however. 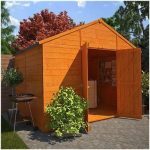 The installation service is designed to make assembling both eh base and the shed a lot easier (though it doesn’t include the installation of the shed, just the base). We personally feel you’d be wasting your money as if you buy the Portabase DIY Timber Base Kit, it is actually very simple to assemble yourself. You will have it up and ready to be used in no time and it comes with great ground spikes that secure it fully into the floor. There is another installation service available and that’s for the shed. If you want to save all of the hassle that comes with self-assembling an outdoor building then this service is for you. The treatments are definitely worth buying however. What’s great about these DIY treatments is that they come in different colour choices. So you can customise the entire look of the building. Cedar red and Ivy Green are two particularly interesting and stylish colour choices to consider. However, don’t forget the Shed Store actually provide a free treatment with the shed so you don’t necessarily need to buy another one. 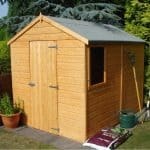 There are a lot of high quality features with this shed, but as the interior doesn’t quite match the same level of quality as the exterior, this does have to be taken into account. Overall this shed should last for years, but it will need to be treated annually. Unless you upgrade the floor you will also need to be careful about what you store so it doesn’t become damaged. 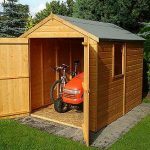 This size shed is the number one choice for homeowners in the UK. It is designed to hold an excellent level of storage, whilst being compact enough to fit into most gardens. 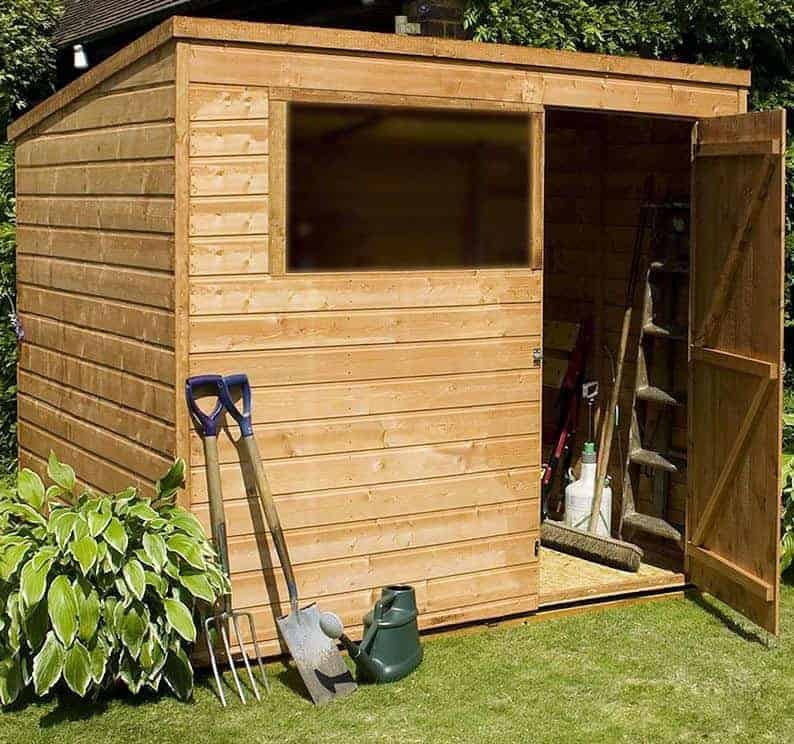 According to customers, this shed is very simple to erect. It will only take around a few hours to assemble and everything you need comes with the building. Though we would have liked to have seen a stronger floor included with the shed, it does provide great value for money. In fact, it is likely the solid sheet interior that makes the shed so affordable. Final Thoughts: In terms of lightweight storage, we think this Windsor shed is perfect. However, we do feel it is a little misleading in the fact that it is advertised as a multi-purpose building. If the floor was stronger we’d agree this is suitable for use as a workshop or work space. However, solid sheet isn’t very strong and will not accommodate heavy furniture or machinery. Despite this misleading factor, we do feel you are getting good value for money. It has an attractive design and the pent roof adds a more versatile design, making installation in height restricted areas much easier.